My pumpkin plant has pretty much not had any leaves on it for the last two weeks. Pumpkin is still growing however. Main vine was buried so the 4 frosts haven't totally killed the plant yet. 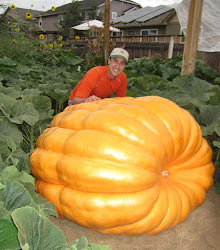 Its put on about 35 pounds since that first frost. I think it will be done tomorrow however. Supposed to get down to something like 26 degrees tonight. Pumpkin is pretty small, but would still love to get every pound that I can on the pumpkin before the weigh-off.